I know of Colm Tóibín more for his presence on the judging panel at the Giller Prize a few years ago than for his work. I lucked upon a $7 cloth of Brooklyn this week which I snatched up as quickly as I could. I had heard that it was a good read, and I was curious to get to know Toibin. I spent some time in his home town of Enniscorthy, in co. Wexford, Ireland, a few years ago and was keen to re-visit, if only via the pages of a novel. Brooklyn begins in Enniscorthy as Eilis Lacey, a young girl with a head for numbers is offered work at the village shop. Eilis lives with her sister Rose and her widowed mother. Her three brothers have gone to England because work is so scarce in Enniscorthy, so she is pleased to find something she can do, even if just once a week. When Father Flood, an Irish priest living and working in New York visits the Lacey home and offers Eilis a job in Brooklyn, she feels that she must accept. She leaves her home and family and starts a new life in America. 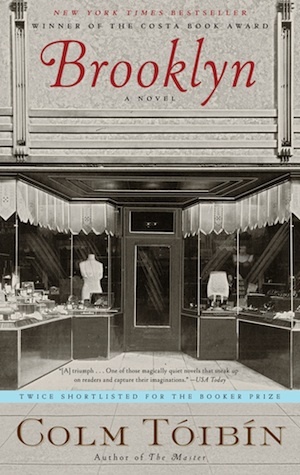 In Brooklyn, she settles in to her boarding house with the tempermental landlady, and her rather frequently inhospitable housemates, and begins work as a shopgirl in a department store. After the initial excitement of transition has died down, Eilis receives her first letters from home, which overwhelms her with loneliness. The helpful Father Flood manages to alleviate her homesickness by involving her in charity work in his parish, and enrolling her in a Brooklyn College book-keeping course. Eilis attends the dances at Father Flood's parish church, and there she meets a young Italian-American man named Tony who makes it clear that he's madly in love with her. She has opportunity for promotion at work and has a pleasant bedroom at the boarding house with enough room for her to comfortably study. She spends all her free time with Tony who is deeply in love with her. When she must return to Ireland, she has to decide whether she will return to New York, or choose to live a familiar and easy life in her Irish hometown. Eilis is a girl without a plan. She is given opportunities for a more prosperous life without having any personal ambition. At every bend in the road Eilis encounters people who want to help her: Georgina, her berth-mate on the passage over shows her the ropes of ocean travel, Father Flood eases her transition into her new life, Mrs. Kehoe (her irascible landlady) offers her the best bedroom in the house because she likes Eilis. But Eilis has no voice to declare that she does not want these favours. This life she now lives is not of her own choosing. She has drifted into her life by not asserting her own will, and by letting others make decisions for her. "Even when she woke in the night and thought about it, she did not allow herself to conclude that she did not want to go." She allows herself to be something of a plaything of fate merely by silencing her own desires. 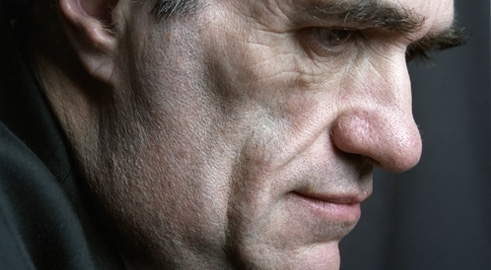 In his calm and understated style (much like the character of Eilis herself), Colm Tóibín has created a character who has the potential to be frustrating to read. And sometimes she is. Because she is shy and wishes to avoid confrontation, Eilis is carried further into situations than she feels comfortable with. She pulls back, but does not speak out, so there is a tension between what is happening to her, and her incremental acceptance that "she had no choice, she knew, but to put it swiftly out of her mind." On her return to Ireland she is able to see for the first time how much she has changed - how much New York has changed her. She is the focus of attention in her home town with her American clothes and mysterious life abroad. But living in Ireland again, her life in New York seems like a dream. She finds her stride with her old friends, is offered a job, and love, and a home. But her other life is there waiting for her to return. No matter which life she chooses, she will make it a good life, but having lived so many years apart from my parents and siblings, my heart was voting for her to choose Ireland rather than America. (I was also not convinced that she loved Tony). But more than one location or the other, I really just wanted Eilis to make a decision based on her own desires rather than being forced into her choice by others. I'll leave you to read the book to see what she decides.